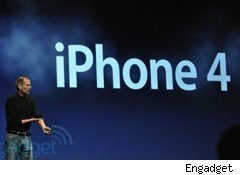 As if Apple (AAPL) needed more help selling its new iPhone 4, two important reviewers gave the new smart phone stunningly positive reviews. In a review that was the top story at WSJ.com Tuesday, the highly regarded tech writer Walt Mossberg said "overall, Apple has delivered a big, well-designed update that, in my view, keeps it in the lead in the smart phone wars." He added, "I'd say that Apple has built a beautiful smart phone that works well, adds impressive new features and is still, overall, the best device in its class." Mossberg went on to praise the handset's new battery, screen, two-way video capability, operating system, and multitasking strength. In an equally glowing review from the New York Times, tech writer David Pogue wrote: "Apple releases only one new model a year, so the new iPhone had better be pretty amazing to compete. It is." He added, "If what you care about, however, is size and shape, beauty and battery life, polish and pleasure, then the iPhone 4 is calling your name." He had positive comments about the same features as Mossberg. And, of course, both writers attacked the quality of the AT&T (T) 3G network as the phone's biggest drawback.